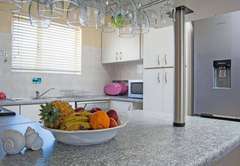 Island View F5 is a property providing self catering in Melkbosstrand for up to 4 guests visiting the Blaauwberg region. 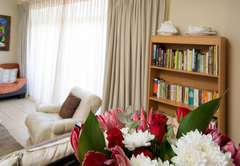 F5 Island View is an affordable luxury self catering apartment in Melkbosstrand. 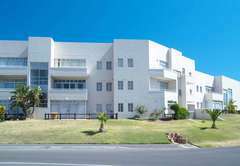 It is situated on the first floor and is just 100m from the beach. The apartment has two double bedrooms and there are two single sleepers in the living area which are ideal for children. 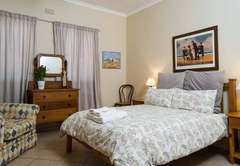 The main bedroom has a colour TV and a hairdryer is also provided. A camp cot is available on request and linen and bath towels are included. The unit has a full bathroom (bath and shower facility). The main bedroom also has shower and basin but no toilet). We do supply bath towels but please bring your own beach towels. The kitchen is fully equipped with an under counter oven, hob, extractor fan, microwave oven, fridge / freezer, dishwasher, washing machine, tumble dryer, coffee maker, slow cooker, toaster, crockery, cutlery, iron and ironing board. 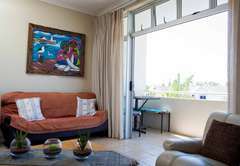 The living area is equipped with DStv and a DVD player and the dining area can seat six people. There is a braai facility on balcony (only charcoal). Safe parking is provided for one vehicle. The unit is strictly a non smoking unit (smoking allowed on balcony) and unfortunately pets are not allowed. 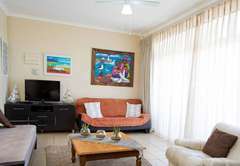 2 Bedroom self-catering unit 100m from beach with 2 double bedrooms. 1 Bathroom with bath and shower as well as shower and basin in main bedroom. 2 Sleeperbeds in living area. 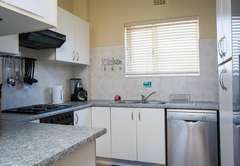 Fully equipped kitchen, balcony with braai, DSTV, safe parking. no sea view. Response timeIsland View F5 typically responds to requests in 5-10 minutes.